Over the past couple weeks, I have noticed a dramatic decrease in the number of eggs I've been collecting from my chickens each day. We have ten hens currently laying (our spring chicks aren't laying yet) and had been used to collecting at least six eggs per day, but lately I've only been getting two or three if I'm lucky. Only got one egg yesterday! The fact that it was so pretty made me feel a bit better. I kept waiting to see if the egg production would ramp back up, but no such luck. I checked each hen over and there was no sign of injury or illness in any of them, so I was desperate to get to the bottom of this mystery. Last night I think I finally figured it out - several of them seem to be molting! Hens will cease egg production during their molt to focus on making new feathers, so this was my first big clue. I hadn't noticed any major feather loss, so I decided to look for more subtle hints that some of they may be molting to confirm my theory. I can always tell when our White Leghorn hen, Chickabod, is molting because her comb starts to shrink. Leghorns have big combs that flop over, and when Chickabod's comb begins to stand up straight, I know it's shrinking and she is beginning the molting cycle. When chickens are in the middle of their molt, their combs may also appear dry and quite pale in color. For hens with smaller combs, the color and texture change is easier to detect than shrinkage. Molting can look different from chicken to chicken, and sometimes it is very apparent by dramatic feather loss. It's pretty shocking when you open up the coop in the morning to let your chickens out and you see a giant pile of feathers under the perch where one of your hens was roosting! In this case it is quite obvious, but sometimes their molt is so light that it's hard to detect. For example, our Production Red hen has the most beautiful, full feathers. However, recently I've noticed her feathers seem a little thinner than normal. I've been keeping an eye on her and last night noticed she only has a couple of tail feathers left. It doesn't seem to be a case of feather picking, so I believe that she is molting as well. 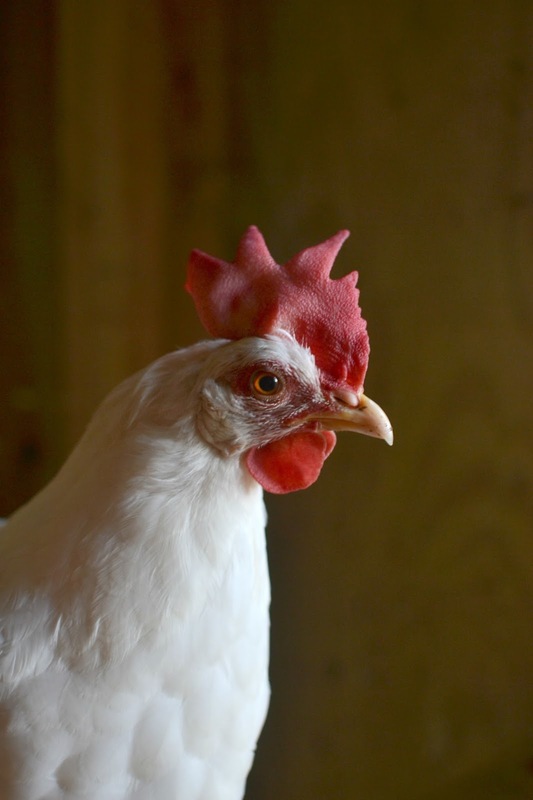 Hint: I find that light feather loss can be more easily detected if you observe your chicken shaking out her feathers or flying up to the roost at night. With slight movement like this, any loose feathers will come out. Last night when Chickabod jumped up to roost, I noticed a few fluffy feathers float to the ground. In addition to her shrinking comb, this led me to believe she really is starting to molt. 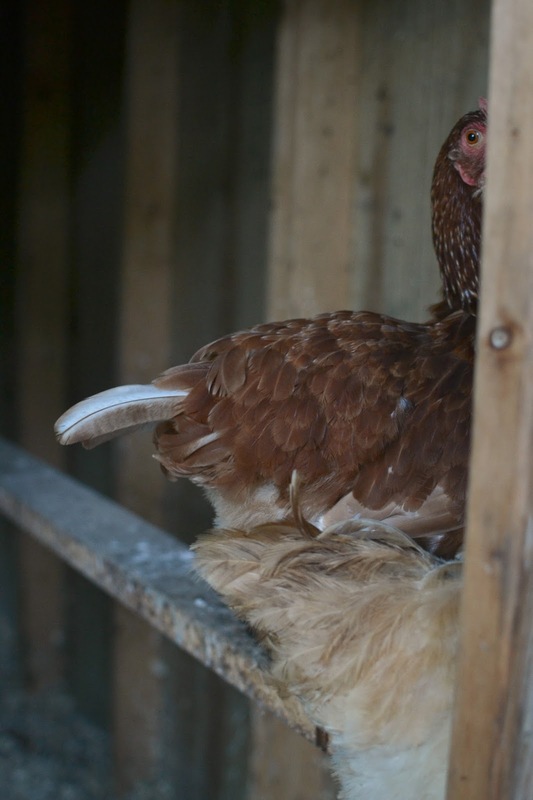 One of the tell-tale signs of molting that can be the most subtle is a difference in your chicken's behavior. I spend some time with my chickens in the morning and the evening each day just observing their behavior, so even slight differences are easy for me to detect. I have noticed lately that Chickabod has been going in at night to roost earlier than all the other chickens, and she doesn't seem to be her usual outgoing, spry self. Of course this could be a sign of all sorts of things (including illness), but this symptom along with her comb shrinkage and light feather loss definitely hints at molting to me. The past few years, our chickens have molted later in the fall so initially it wasn't really on my radar to think that they may be molting. However, we have had a relatively cool summer overall, and especially the past few weeks our temperatures have been well below normal (it has rained a lot as well). I think this may have signaled to their systems that fall is on the way and triggered their molting a little bit earlier than in previous years. It's so fascinating to see how the weather plays a part in chicken keeping. No two years are exactly the same, especially here in Missouri, and this always keeps me on my toes! Have you noticed any subtle signs of molting in your flock yet? Yes Tammy I have noticed a decrease in egg production and some molting just recently. The weather's so weird this summer that maybe their internal clocks are as confused as mine! It's good you recognize the signs though, so you're not worried for no reason. Tammy... I haven't noticed subtile signs... I've noticed full-out molt! I, too, think it's our cooler than normal summer this year... we are in the 70's right now, haven't gotten above 85 this week, and rain off and on. They held their feathers well into fall last year during the drought. I have noticed all my roosters have lost their tail feathers already, and the hens are beginning to look threadbare, too. Good reminder post! Perfect timing for this post. Just got back from vacation and couldn't figure out why some of my birds had lost most of their tail feathers. It's molting season ( Smack forehead with hand) Of course thats it! Sometimes they look so rough when moltling you can't help but feel bad for them. Interesting! I love visiting and learning something too! Thanks Tammy! I hope you have a great weekend my friend! Always a good read. Have a great weekend. Same here in the UK. My in-laws chicken eggs are pretty non existent. Our ladies aren't laying yet, but when we had hens years ago we always went through molting & slowing of egg production during shorter daylight hours. I've been very curious how this is going to affect our pullets - they should be coming of egg laying age just when the world here is slowing down & getting darker & colder. So I'm wondering if their egg production will wait until spring. That is a gorgeous egg - and a stunning portrait of Chicabod! I hope the molting passes quickly. It is a pretty egg and I love your chicken photos. Have a happy weekend, Tammy! Sadly, no flock here, but I enjoy reading about yours. Interesting Tammy! I would assume they would cease egg laying as they molt.. these things need focus, right!? Anyway .. the blue egg is AMAZING! Most people don't realize all the variation in egg color ~ they consider eggs to be brown or white. Have a nice weekend! This is something new Tammy. Thanks. We only have three chickens, our egg production has been down as well. There is no sign of molting, I think it may just be the heat. We went through this last summer as well. Interesting information! Hope your hens get through their molting and get back to egg production quickly. I will be watching the ladies for more of the signs you mentioned. There is one I am very suspicious that may be molting! Very informative. You are so observant of your chicks. I love the second pic, you did a perfect job lining up the shot! My chickens are not so subtle! LOL!! Great post Tammy, really useful info. Same here! Low eggs, kind of grouchy....(sounds like me)..lol.....Love the blue egg! Great post!! I thought it was fall here, too, the other morning. Brrr. Thanks for the post. At least I'll have an idea of what to look for. Oh, I forgot to mention, I love the new header. Especially little Gizmo's curious kitty face! We are currently undergoing the molting period in our coop as well! Got our first egg today for the first time in a while. Feathers everywhere! Feathers everywhere in our coop too. I love love love your new header! I understand why they are molting --- with this heat!! They probably want to go naked if they could!!! Nice new Title photos! I thought I was on the wrong site when your post opened up!! Sweet baby kitty!! How interesting! Just realised how ignorant I am when it comes to rearing chooks. This is very helpful information. I've pinned it to our community chicken board. That egg is beautiful and the photo of your Red is sweet...peek a-boo!